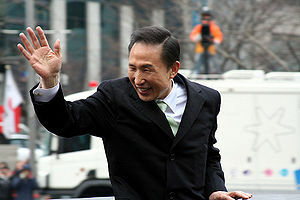 Lee Myung-bak (born in Osaka, Japan, December 19, 1941) is a politician and was the 10th president of the Republic of South Korea, succeeding Roh Moo-hyun. He was inaugurated on February 25, 2008, having won the December 19, 2007, election with 48.7% of the vote. He is a member of the Grand National Party. On February 25, 2013, he was replaced by Park Geun-hye. This page was last modified on 9 April 2019, at 11:33.